What is the Easter bunny leaving you this year? A coupon at Merry's Stitchins! Stop in and choose an egg from our basket, where you'll find a coupon to use for your purchase that day! If you've ever found one of the mystery coupons in our shop in previous years, you'll know we hide some pretty good ones! Come visit us on Friday, March 25 and Saturday, March 26th for our Mystery Egg Days! three to qualify for some great prizes! As an added bonus, we are selecting some kids and novelty prints to clear out of the classroom, too, at a bargain for you! 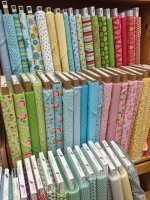 Fabric, magazines, Frivols, Tips and MORE! Are you following Merry's Stitchins on Facebook? Check in there to see posts of new items and inspiration!